We’re just a few days away from the return of Hellboy, Lionsgate’s R-rated reboot of Mike Mignola’s signature hero. Now, a new teaser shows just how much the studio will lean on that rating, with plenty of carnage to go around. 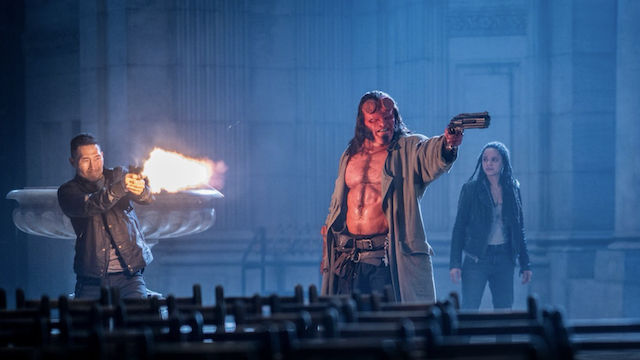 JoBlo Movie Trailers posted the “Hellboy Super R-Rated Sizzle Reel,” which features a lot of blood and cursing. Especially from Hellboy himself. The trailer also provides details on what to expect from the main villain of the film, Nimue the Blood Queen (Milla Jovovich). Ian McShane’s Trevor Bruttenholm explains, “She is the queen of blood- and for f***ing good reason.” It depicts Nimue’s first demise, before her return in modern times. The footage also features the Bureau of Paranormal Research and Defense to call upon Hellboy to stop Nimue’s rampage. The clip introduces a few superpowered Nazi foes, while giving Hellboy a chance to use his Good Samaritan gun. Hellboy shows off his physicality by slamming a demon onto a post in a wrestling ring. The trailer definitely sets a mood for the film’s tone. You can see David Harbour and the cast in action when Hellboy arrives on April 12. What do you think about Hellboy‘s R-rated teaser? Let us know in the comment section below!